This summer heat wave is never ending, which means it's time for a frozen and frosty beverage. I'm not a big fan of rum drinks, one of those overindulgences I'd like to forget from my college days, so my frozen cocktail choices are limited. 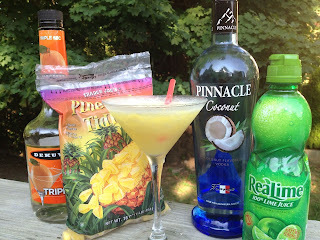 I love anything flavored with coconut or pineapple, so I recently challenged Papa C&G to whip me up a frozen cocktail in his blender. This is basically a margarita with the coconut vodka standing in for the tequila (again, not a huge fan for the same anti-rum reasons) and it turned out to be delicious. Ko Olina is the Hawaiian resort we stayed at a few years ago with the Grandparents C&G, so it seemed like an appropriate name for a Papa C&G creation. It has that wonderful taste of the tropics and thankfully no rum needed!